Are you a gatekeeper or information source? For the last ten years we’ve had discussions with our real estate customers that go something like the one below. DBT: Hi Sally, we were just reviewing your account and wanted to let you know there may be some improvements you can make on the information you’re putting into your ad codes. You have a minute to chat about that? Sally: Oh, I don’t want to give them ALL the info. If I give them everything they want they won’t want to talk to me. DBT: We totally understand. Frankly, that may have worked in years(or maybe decades) past. Also, you’re right, they may not want to talk to you right now. You have a minute for a quick experiment? DBT: Ok, let use your listing at 9920 Hafflinger Lane in the zip code 89521as an example. Are you in front of your computer or have your cell phone handy? If so, open up Google. DBT: in the search box type in “9920 Hafflinger Lane, 89521”. What are the first five results on the page? Sally: Uhmmm, zillow, realtor.com, redfin – twice and Trulia. DBT: What kind of details are you seeing in the results, even before you click on them? Sally: Uhhhhh, Price, beds, baths square ft…..
DBT: The net result Sally is this. Every person who sends in a text message inquiry on one of your properties is a potential client. Their expectations were either met or not. Today a person is more likely to respond positively to your follow up call or text message if they’re happy because the initial interaction – the instant text message with property info – met or exceeded their expectations. Don’t be afraid to give people all the information that’s only a few clicks away if you don’t. This usually makes the light bulb come on for folks. Either you’re going to be the information provider for prospects or someone else will. If you’re not willing to share the information, someone else is, and the info is readily available to anyone with a smartphone or computer. When people use a text for info system like DriveBuy Tech they expect to get up to date information about the property listing such as # of Bedrooms, # of Bathrooms, Square footage, Price, Agent Contact Information and access to property photos. Also, you have to remember that the person who requested the text message may not be looking for a property but he or she may have a friend who is. Providing one comprehensive and simple text message with all the pertinent details(Don’t forget your contact info!) allows that person to easily forward the info on to his or her friend who’s in the market. 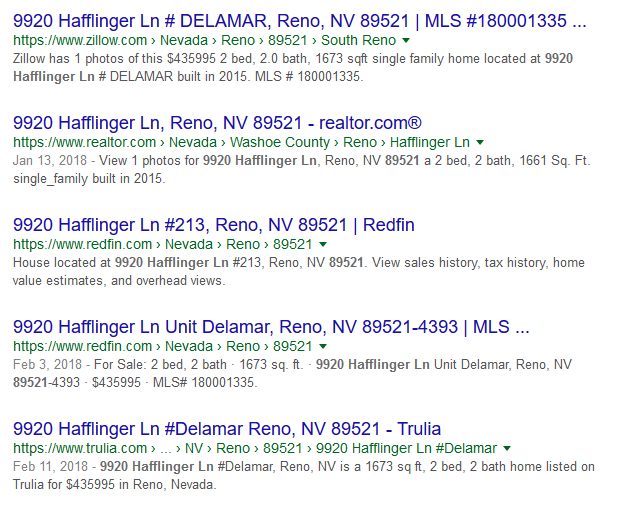 Try the google my listing experiment and let us know what you think!